Mary wants to be a hero when she grows up; she wants to be like the President, and do everything she can to stop the bad guys from hurting innocent children, like President Obama wants to do in Syria. We collaborated on her picture. After watching his speech today, we talked and I asked her to draw how she felt; tell the story in a picture. This is her composition, her concept. She explained the arm, and told me who all the people were, etc. 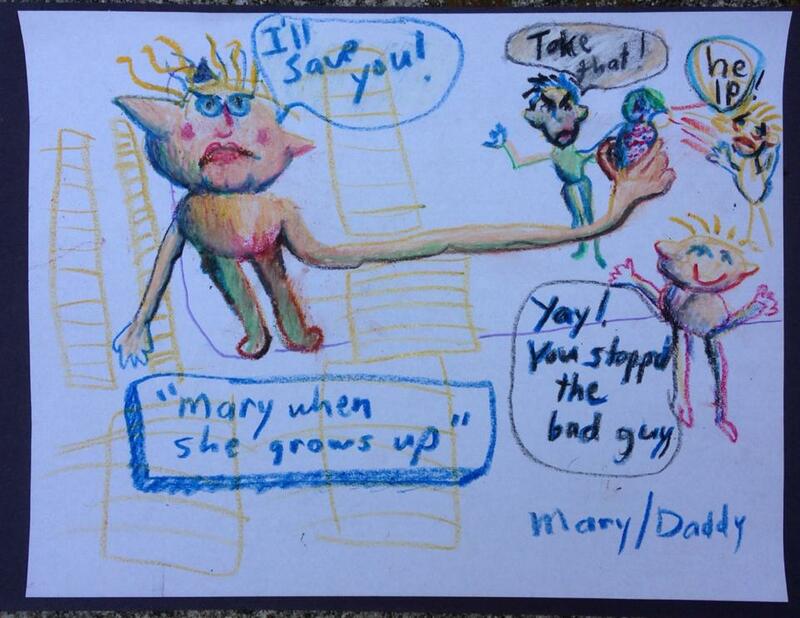 I enhanced the images with color and form, using oil pastels, to help convey the story inspired by and honoring her rough drawing and using it as a guide. The thought bubble she drew was “help” (upper right). And on the back she had written the title, “Mary when she grows up,” which I transferred to the front. She dictated the other bubbles. My friend Jason told me of other father/child collaborations and so decided to try it. Normally I don’t believe in messing with anyone else’s artwork but she was 100% on board with it.